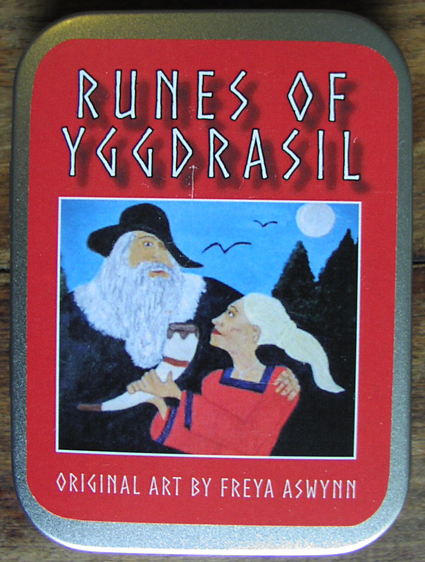 Last week I treated myself to a copy of a new set of divination cards - the Runes of Yggdrasil by Freya Aswynn, which she produced in partnership with Atlantis Bookshop. In the past I'd never really got to grips with using the Runes, although I once had a go at making my own set, I've read a few books on the subject and even gone to a workshop or two. However, when I saw the Runes of Yggdrasil - which are printed on cards with vibrant illustrations as well as the Rune symbols - I really felt that was a form I could work with. I started using them by taking a card every day and my initial feelings were correct - this is a great way of learning to use Runes and my readings have felt accurate. 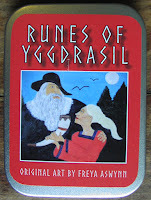 We are very excited to be able to offer you a unique opportunity to own this intriguing new deck of rune cards, painted and privately published by the world-renowned rune expert, Freya Aswynn. Created as a signed, limited edition of just 200 sets, they are presented in a handsome metal tin and are accompanied by a booklet providing Freya’s personal perspective on each of the runes. This deck costs £30 and is available exclusively from The Atlantis Bookshop, 49a Museum Street, London, Eng WC1A 1LY. Atlantis is happy to post out decks for those who cannot get to the shop – call 020 7405 2120 for further information.